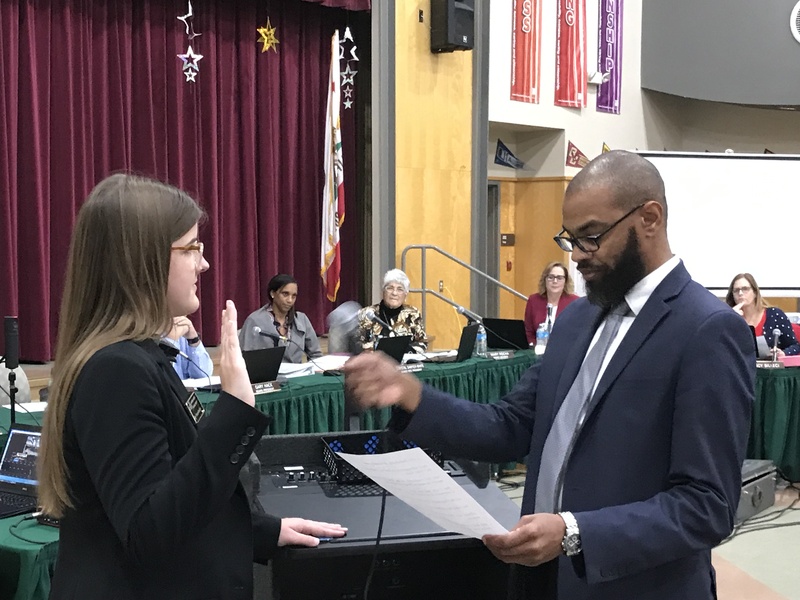 New Trustee Ellie Householder is given her ceremonial oath of office by Antioch Councilman Lamar Thorpe on Wednesday, Dec. 12, 2018. 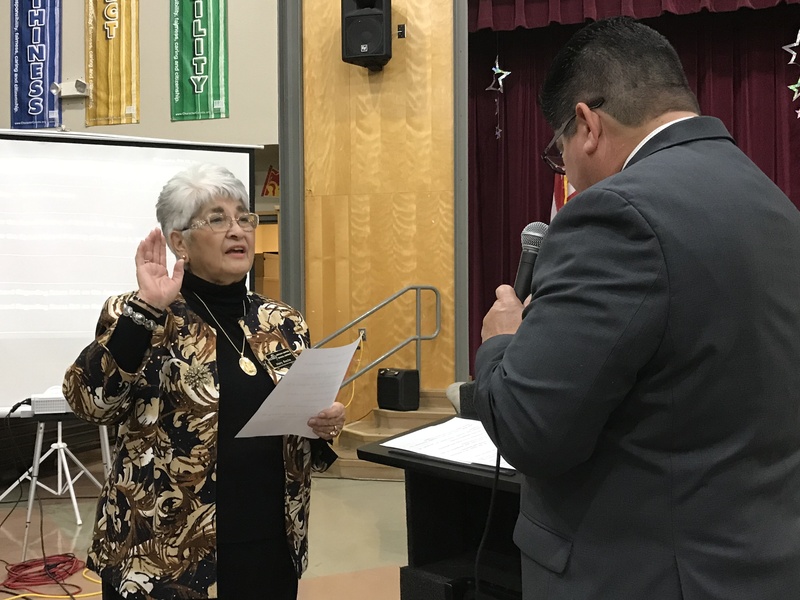 New trustee Mary Rocha during her first ceremonial oath of office administered by her son and Antioch High Principal Louie Rocha, Jr.
At their meeting on Wednesday, Dec. 12, 2018, the Antioch School Board welcomed two new members elected in November, Mary Rocha and Ellie Householder. 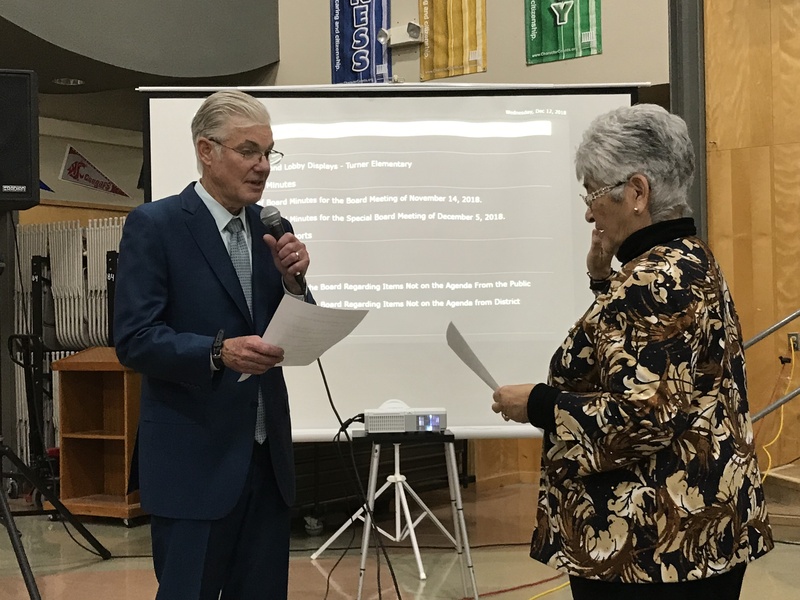 Both held ceremonial oaths of office in front of the audience inside the Lone Tree Elementary School auditorium, as they had each been sworn in as new members previously, so they could participate in a closed session meeting earlier that evening. Householder was first to take her ceremonial oath, with Antioch Councilman Lamar Thorpe swearing her in. She then introduced her family who was in attendance. “My mother flew all the way from Arizona to be here tonight,” she said. 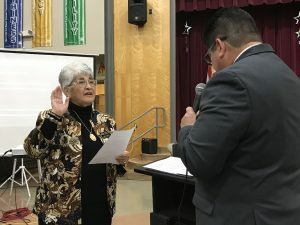 Former Antioch mayor, councilwoman and school board trustee Rocha held two ceremonies. First, with her son Louie Rocha, Jr., the principal of Antioch High School, administering her oath. She said she had asked State Superintendent of Public Instruction Tom Torlakson to swear her in, but he was late. When he showed up a few minutes later, Rocha had him give her the oath, again. Rocha taking her second ceremonial oath of office, this time administered by State Superintendent of Public Instruction Tom Torlakson. Rocha introduced the rest of her family, including her husband Louie, Sr. She mentioned her “40 years of friendship and working together” with Tom Torlakson. Rocha asked her family members to stand and thanked them, getting choked up as she spoke. “I just want to thank everyone of you because each of you have done something special for me,” she said. 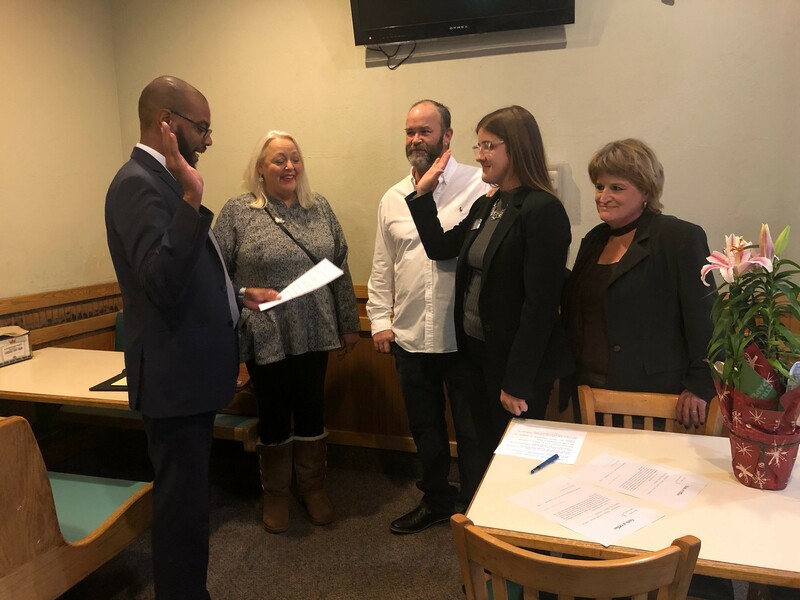 New Antioch School Board Trustee Ellie Householder takes her official oath of office administered by Antioch Councilman Lamar Thorpe, as her parents Dave Householder and Karen Matty, and Antioch Mayor Pro Tem Joy Motts, second from left, look on, at the Round Table Pizza restaurant, early Wednesday evening, Dec. 13, 2018. The new board’s first major issue was to appoint a replacement for Rocha, who resigned on Dec. 7 following her election to the school board. Three people applied, including former Antioch Councilman Tony Tiscareno who lost for reelection in November, and Shagoofa Khan and Dr. Clyde Lewis, Jr. who were unsuccessful candidates for school board, also in the November election. Khan did not show up for the public interview, so only Tiscareno and Lewis participated.in the question and answer process. This entry was posted on Thursday, December 13th, 2018 at 10:28 am and is filed under News, Politics & Elections, Education. You can follow any responses to this entry through the RSS 2.0 feed. You can leave a response, or trackback from your own site. Tiscarino? This is a joke right? Cant you politician make an honest living without feeding off the public trough for one second?!? I mean you guys are so drunk on your corruption that you dont give a darn about how stupid you look to the average taxpayer! The stench from the dais is making me clench! Oh but there will be a day of reckoning. You “public servants” that are bleeding us dry like the bunch of union vampires will see the consequences you’ve wrought on us citizens! Especially you braggards that have been at it for decades.